﻿We offer both an in-hospital and an online pharmacy for your convenience. Our online store is a partnership with an approved veterinary pharmaceutical distributor, so every product carries the same guarantee of quality and safety as the hospital stock. 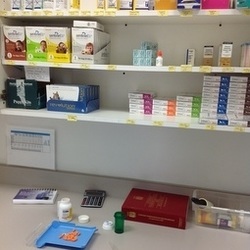 Most commercial online pharmacies do not follow such strict rules for drug handling, so the manufacturer warranty is void for those prescriptions.